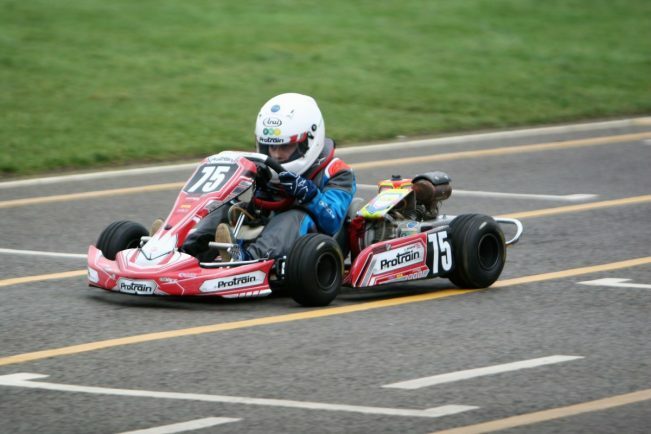 Harrison Morrow in action at round 1 of the Whilton Mill Kart Club championship. Picture by 569 Media. 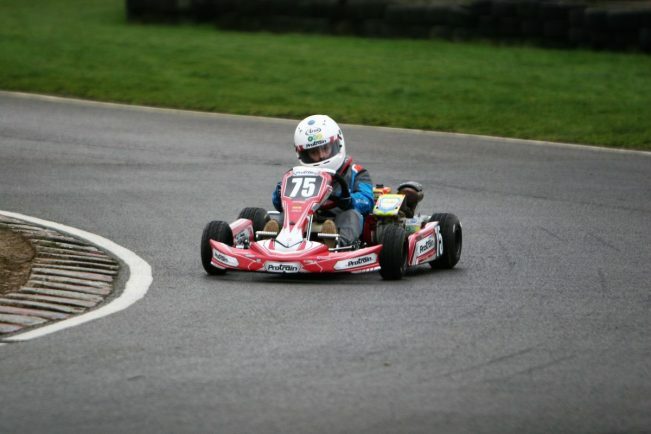 FRUSTRATION with the changing weather conditions was a recurring theme for Harrison Morrow and his racing team at last weekend’s opening round of the Whilton Mill Kart Club championship. The constant need to change the set-up of the Solihull driver’s kart did little to help post times representative of his true pace on the track. Morrow remained upbeat, describing the weekend as “good experience” in his “first full season of racing”, one that will undoubtedly help aid his progression as a driver enormously. 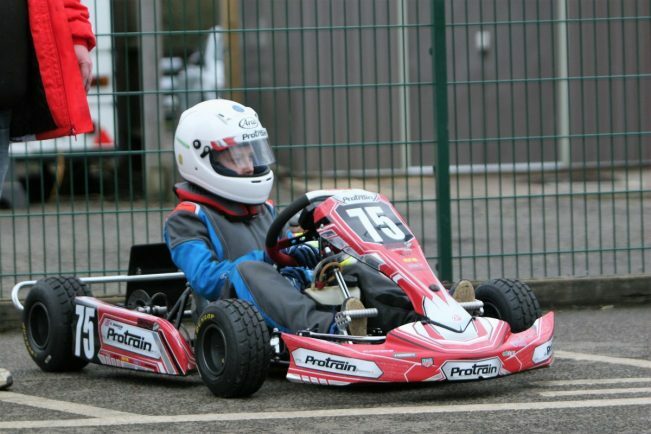 Saturday’s practice revealed just how tough the subsequent heats would prove to be, as the 9-year old racer struggled to get to grips with the ever-changing circuit conditions. On race day morning, with weather still proving temperamental, a handling issue with the kart was rectified prior to the opening heat – as Morrow lined up alongside the rest of the 44 Honda cadet karts taking part overall. Starting in 32nd place, the driver started cautiously to avoid any possible first lap crashes that are commonplace on tricky track conditions. His approach paid dividends as he avoided two separate incidents to move up the rankings, moving with good pace and attempting to catch the next group of karts in front. He would post the 21st fastest lap, en route to settling for 28th place after losing ground avoiding a couple of crashes. The second heat again saw Morrow start in 32nd place on the grid, but he found it much tougher to gain ground on those ahead of him despite his attacking intent to challenge higher up the rankings. More experienced drivers ahead of him proved a stumbling block despite posting impressive lap times, again finishing 28th. The final heat saw a more promising position of 29th on the grid, but a clutch issue would hamper his start to the race as he came out last on the first corner. Despite this set-back, the Solihull racer continued to fight hard with drivers ahead of him, often overtaking his rivals, but showing his inexperience when remaining behind them at the flag. In what was becoming somewhat of a trend for Harrison Morrow, he finished 28th in the third heat. The B final saw treacherous conditions, with Harrison’s team opting to change the kart set-up to handle wet conditions, though by the time of the race start, the race would be ran with no weather issues. It would serve to halt his progress despite starting in 11th, meaning he would lose two seconds a lap on average compared to his normal time, finishing last with a time penalty. Morrow also stated that “it’s a long season” and understands he will have a better rub of the green in forthcoming races. A two week break commences before Morrow’s next event at round 2 at Shenington, where he and his team will hope the weather will be a lot more co-operative.